There is always a moment when the holiday season kicks in: the first fluffy snowfall, the first decorations on sale in September, the Macy’s Parade, the smell of baking spices wafting through the house. With respectful acknowledgement that celebrations and interests vary, our family loves Christmas time and it begins when we bring the first box in from garage. We engage in a series of ritualistic festivities that begin the Tuesday before Thanksgiving and continue through New Year’s Day when I strip every trace of red and green from my house and pass out from exhaustion. We are “stuff” people and “story” people and during the holidays we show off both. We unpack and place objects in certain locations, at certain times, in certain ways. 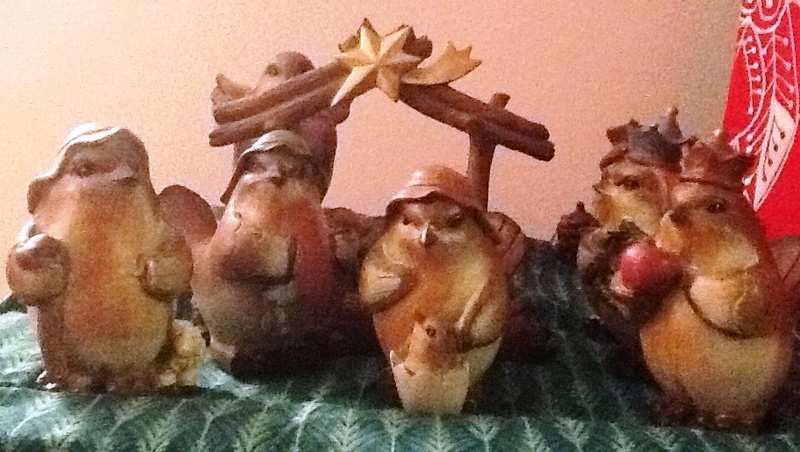 Here are a few totems from our familiy history all decked out in narrative garland. We own about a million Christmas CDs. We have a version of nearly every holiday song ever recorded by any creature (including cats and the Partridge Family). The rest of the household plays these covers, mostly atrocious, with delight. I only listen to one CD and this is it. Over and over. For me this is the only soundtrack for Christmas; for the rest, turning it off and rolling their eyes is part of their seasonal entertainment. 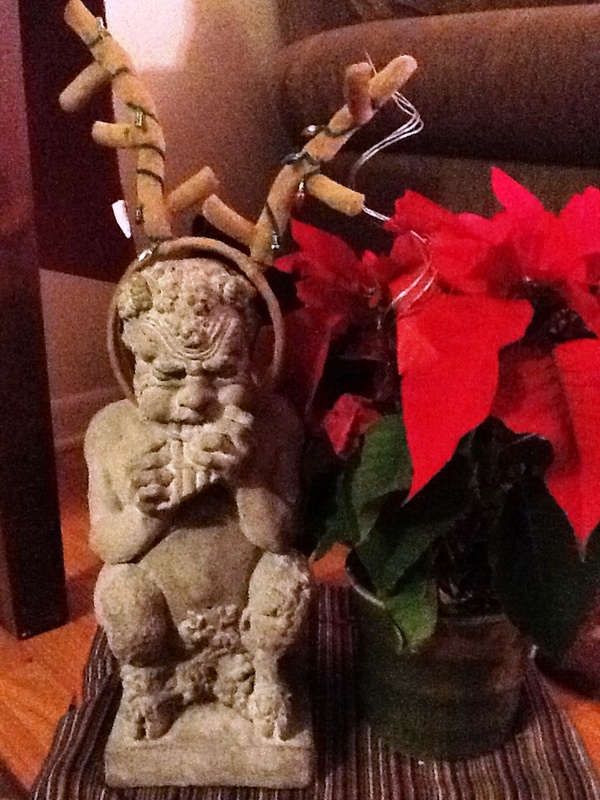 Pan lives in our house but no notices him until he puts on his antlers. Every year at least one visitor says, “Is that an elf? Or more bluntly, “What is that?” To which the family nonchalantly says, “Oh that’s just Pan” and keeps on chatting. 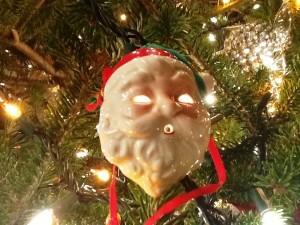 This is Devil Santa. No one is really sure where he came from or when, but he is always positioned on the tree in a way that highlights his evil nature. When the boys were little, Devil Santa was creepy. At some point they accepted him as an essential balance to all the otherwise irrepressible goodness. The Christmas we lived in Japan we could not pack our usual “stuff” and had no money to buy replacements. 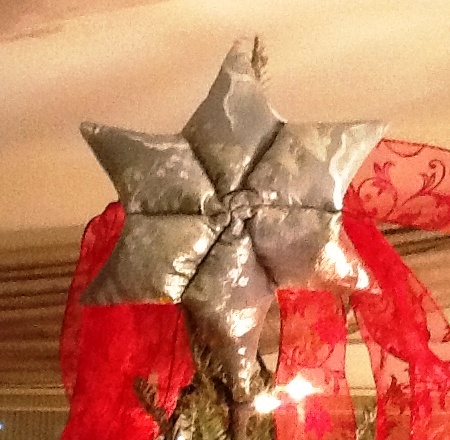 So we decorated our tree with origami cranes, washi covered eggs and kimono scraps sewn into shapes. This star is the last remnant of that tree, hand sewn from a flea market obi. 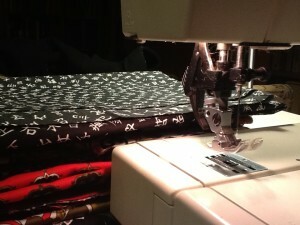 During the holidays I attempt to make every gift we have to give in three weeks. The sewing machine hums every night until I have my seasonal nervous breakdown and put it away. I like Jesus stories and accordingly I sing lots of Medieval passion play carols, tell supernatural saint stories and display a few nativity sets. This one we bought on a family vacation to San Capistrano, California. With misty reverence I told the boys about the returning sparrows and their magical haven. 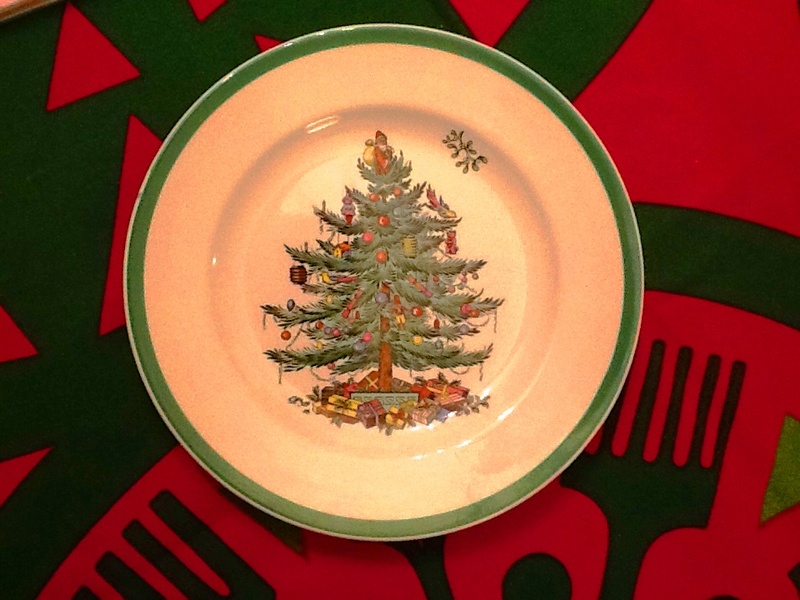 The first year after we were married, my mother-in-law sent me what would become an annual gift of Spode Christmas Tree dinnerware. Her mother-in-law had also given it to her throughout her life. At first I was skeptical, the pattern seemed a bit old fashioned. But as time has passed and my husband’s cooking skills rival those of any Top Chef, our holidays are all about beautiful food. And we eat everything from December 1 until December 31 on these plates. 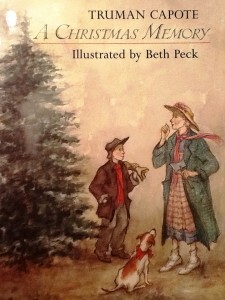 We have read this book on Christmas Eve for twenty-five years. There is a point in the story where everyone in our family cries. Triggered by kites and bones and fruit cake, this moment captures the cumulative emotion of the year in one cathartic, collective sob. Then we eat shrimp. The Odetta album was my favorite when I was a child and really still is. I just bought it for my four-year-old and it’s now her going-to-bed music every night, perfect for that. I can’t wait till she’s ready to sing along. I want to live at your house from the Tuesday before Thanksgiving to January 2nd! It sounds like a reverently irreverent good time. 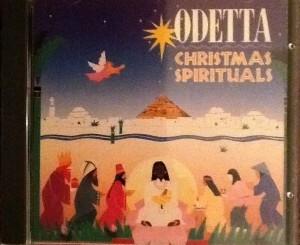 That Odetta record also has a very special place in my Christmas memories. My family played it over and over every Christmas season when I was a kid. I spent hours stringing popcorn and cranberry chains while singing along to it. Whenever I see a used LP copy of it now, I snap it up and give to someone. It’s just so amazing. Tim, you and I have shared this before – but if I were to imagine the voice of God, it would be Odetta’s voice. My favorite, “Virgin Mary had One Son.” And you are welcome anytime. We have a lot of plates. Thanks for sharing these, PB. Some of my own personal Christmas totems include the “John Gary Christmas” album and three slightly chipped plaster wise men (sans nativity scene). Oh, and some molasses popcorn balls. 2: What he said! Will you adopt us all for Christmas, Pandora? When I was growing up, my mom gave me one Christmas ornament every year for Christmas, so that when I was an adult and had my own tree, I’d have wonderful memories to put on it rather than having to buy all new ornaments. It’s such a sweet, thoughtful thing to do, and now I have a tub of christmas ornaments. In my garage. Because I have never had a tree of my own, as I always – and now, WE always – spend Christmases with our parents and siblings. Stella and I could have had a tree, in theory, but our house was the size of a matchbox, so it would have had to be a really tiny one. But RB recently declared she wants a tree of our own next year, so by god, we’ll have one. Even if we’re away for the two weeks over Christmas as usual. LP, if you have a tree next year but are away for two weeks, Jen and I can drop in, turn on the lights, and have a cup of eggnog around it while you’re gone. K thx bye! P.S. PB, I think I mention that Odetta record in a comment every December. I’m sure everyone is thinking, “All right already! We get it. It’s a really good record.” Sigh. P.P.S. Have I told you that that’s Spike Lee’s dad, Bill, playing upright bass on it? I did? Okay, just wanted to make sure.